reported in 1966-67 is continuing (Figure 1). year for measles, 9,443 cases were reported to NCDC. the comparable period in 1966-67. 4-week period in 1967 (Figure 3). the corresponding 4-week period in 1967.
stockpile, visited 16 public and parachial schools. and 15 percent, respectively, of the reported cases. of 367 meningococcal isolates submitted to NCDC. SEP OCT NOV. DEC JAN FEB MAR. APR. MAY JUN. JUL. AUG.
spectively. 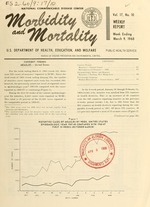 Seasonal trends of human brucellosis in 1967.